Images from the Cassini mission show river networks draining into lakes in Titan's north polar region. For many years, Titan’s thick, methane- and nitrogen-rich atmosphere kept astronomers from seeing what lies beneath. Saturn’s largest moon appeared through telescopes as a hazy orange orb, in contrast to other heavily cratered moons in the solar system. In 2004, the Cassini-Huygens spacecraft — a probe that flies by Titan as it orbits Saturn — penetrated Titan’s haze, providing scientists with their first detailed images of the surface. Radar images revealed an icy terrain carved out over millions of years by rivers of liquid methane, similar to how rivers of water have etched into Earth’s rocky continents. While images of Titan have revealed its present landscape, very little is known about its geologic past. Now researchers at MIT and the University of Tennessee at Knoxville have analyzed images of Titan’s river networks and determined that in some regions, rivers have created surprisingly little erosion. The researchers say there are two possible explanations: either erosion on Titan is extremely slow, or some other recent phenomena may have wiped out older riverbeds and landforms. A paper detailing the group’s findings will appear in the Journal of Geophysical Research-Planets. What accounts for a low crater count? Compared to most moons in our solar system, Titan is relatively smooth, with few craters pockmarking its facade. Titan is around four billion years old, about the same age as the rest of the solar system. But judging by the number of craters, one might estimate that its surface is much younger, between 100 million and one billion years old. What might explain this moon’s low crater count? Perron says the answer may be similar to what happens on Earth. For example, plate tectonics, erupting volcanoes, advancing glaciers and river networks have all reshaped Earth’s surface over billions of years. On Titan, similar processes — tectonic upheaval, icy lava eruptions, erosion and sedimentation by rivers — may be at work. But identifying which of these geological phenomena may have modified Titan’s surface is a significant challenge. Images generated by the Cassini spacecraft, similar to aerial photos but with much coarser resolution, are flat, depicting terrain from a bird’s-eye perspective, with no information about a landform’s elevation or depth. Perron and MIT graduate student Benjamin Black set out to determine the extent to which river networks may have renewed Titan’s surface. 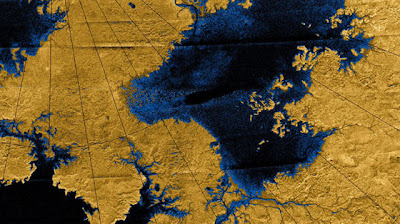 The team analyzed images taken from Cassini-Huygens, and mapped 52 prominent river networks from four regions on Titan. The researchers compared the images with a model of river network evolution developed by Perron. This model depicts the evolution of a river over time, given variables such as the strength of the underlying material and the rate of flow through the river channels. As a river erodes slowly through the ice, it transforms from a long, spindly thread into a dense, treelike network of tributaries. Black compared his measurements of Titan’s river networks with the model, and found the moon’s rivers most resembled the early stages of a typical terrestrial river’s evolution. The observations indicate that rivers in some regions have caused very little erosion, and hence very little modification of Titan’s surface. Going a step further, Black compared Titan’s images with recently renewed landscapes on Earth, including volcanic terrain on the island of Kauai and recently glaciated landscapes in North America. The river networks in those locations are similar in form to those on Titan, suggesting that geologic processes may have reshaped the moon’s icy surface in the recent past. This research was supported by NASA’s Cassini Data Analysis Program.